He remembers it so you don't have to. The Nostalgia Critic is a cynical critic who, in the original run, reviewed movies and TV shows from The '80s, The '90s, and occasionally the early 2000s, although in a few cases he reviewed films from later years than this, such as his reviews of The Room (2003), Alone in the Dark (2005), and Ponyo (2008). He has a bit of a temper problem, but is otherwise very sarcastic. ...that was, until, on January 22, 2013, the Nostalgia Critic's return was announced, bringing the end of Demo Reel along with it. Episodes resumed February 5, 2013, with reviews on a fortnightly basis, though now with editorials and mini-reviews on the weeks in between, and no cutoff date. The show also took on Malcolm Ray and Rachel Tietz, who played Tacoma Narrows and Rebecca Stoné on Demo Reel, respectively, as co-stars with skits done in between the reviews. In 2014, Tietz left the show to pursue an acting career in California, saying goodbye to the fans in the review of Face/Off, and was replaced with her friend Tamara Chambers, who had previously appeared in the review of Catwoman. Tamara's own series, Tamara's Never Seen, where she reacts to popular movies she had never seen before, and "Tamara Just Saw", where she reacts to movies still in theaters, has gotten its own page. In 2017, after several years where the mini-reviews were framed or categorized as editorials, fuller-sized but not fuller-produced reviews began appearing in the in-between weeks once again. Since 2015, the format of the show has slightly changed as well with the reviews being split between the usual style (NC talking over movie clips) and clipless style (where NC still reviews the movie, but the review is acted out rather than showing clips). The latter is normally reserved for Youtube to avoid copyright with certain companies like Disney and Warner Bros, as well as to tackle certain movies still in theaters rather than wait for them to come to video. Though otherwise the format is largely fairly similar. You can see his videos here . Recaps of his episodes are here. Vote on his best review here . 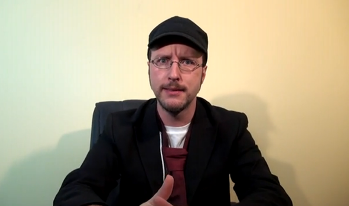 "I'm the Nostalgia Critic! I remember it so you don't have to!"